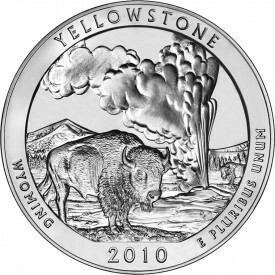 If images recently released by the United States Mint are any indicator, collectors will have several nicely detailed bullion America the Beautiful Silver Coins to look forward to later this year when the strikes make their debut. 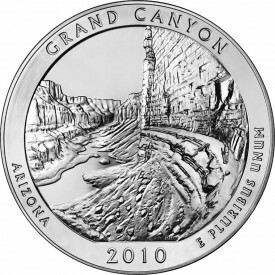 According to the U.S. Mint, production of the three-inch, 5-ounce .999 fine silver bullion coins began on September 21, 2010, with launch dates for each of the 5-ounce 2010 America the Beautiful Silver Bullion Coins still unknown. 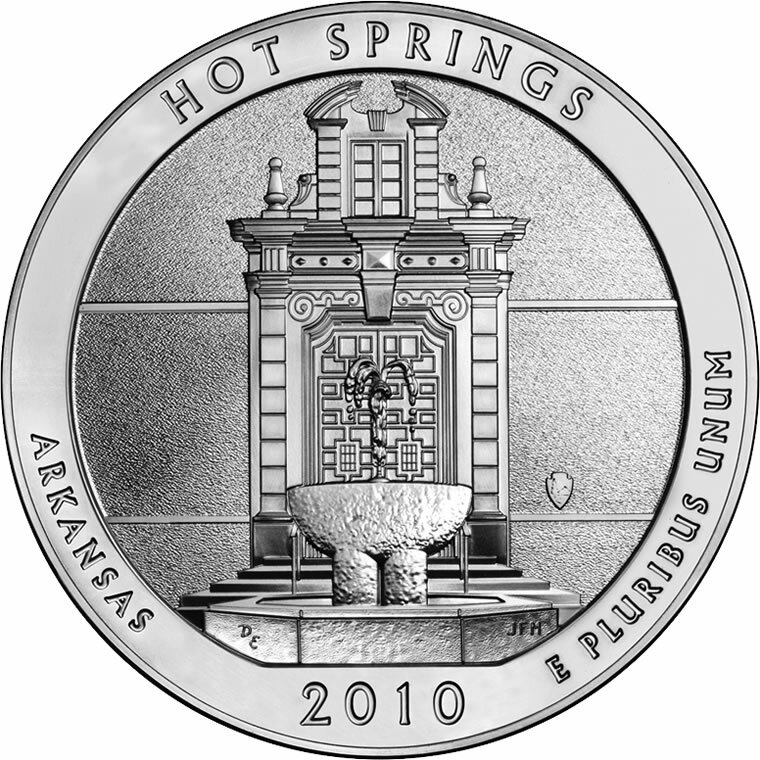 The Mint is required to issue them during the 2010 calendar year, but has only indicated that they will be released in intervals and expects the first one out this fall. 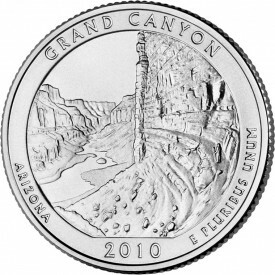 "Feature-wise, the designs are identical, however, the relief on the 3-inch bullion coin is reduced because of the ratio of the thickness to diameter is lower on the bullion coin. More detail will be present on the 3 inch since each work die is engraved and not hubbed. 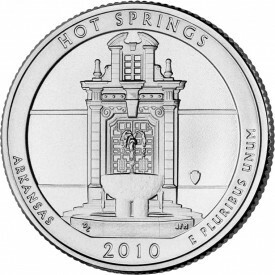 The hubbing process (used on standard coins like the quarters) softens the design and removes detail." 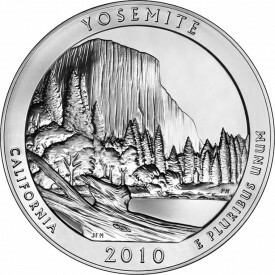 Interestingly, statements made by Mint officials earlier in the year indicated that their large 3-inch diameter made the five ounce strikes extremely thin, resulting in a "crumpling effect" when the mandated inscriptions (‘.999 FINE SILVER 5.0 OUNCE’) were placed on the edge. Those initial technical problems have been eliminated. 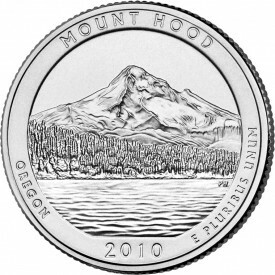 Now with production of the silver coins in full swing at the Philadelphia Mint, there are plans to issue up to 500,000 for distribution through its network of Authorized Purchasers. Individual buyers will then be able to purchase the strikes from the network or through local coin dealers and precious metal providers who acquire them. The Mint has talked about the possibility of collector versions that would be sold directly to the public, but a decision is yet to be announced as to whether that will happen. 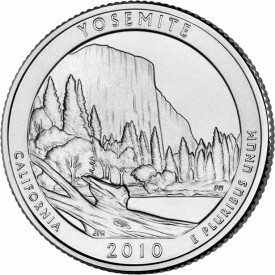 Presumably, if issued, they would feature the "P" mint mark. 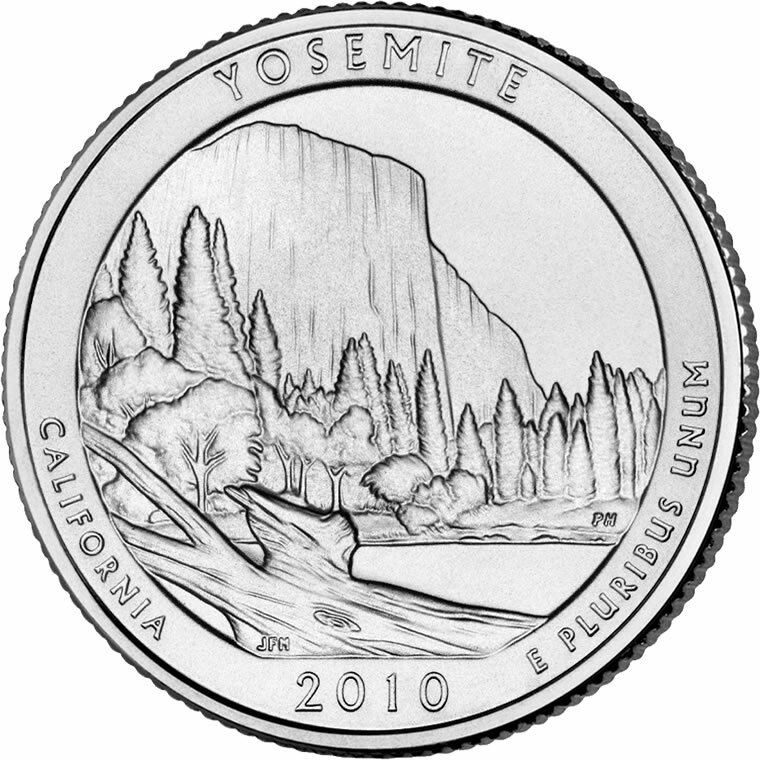 The bullion coins have no mint mark. 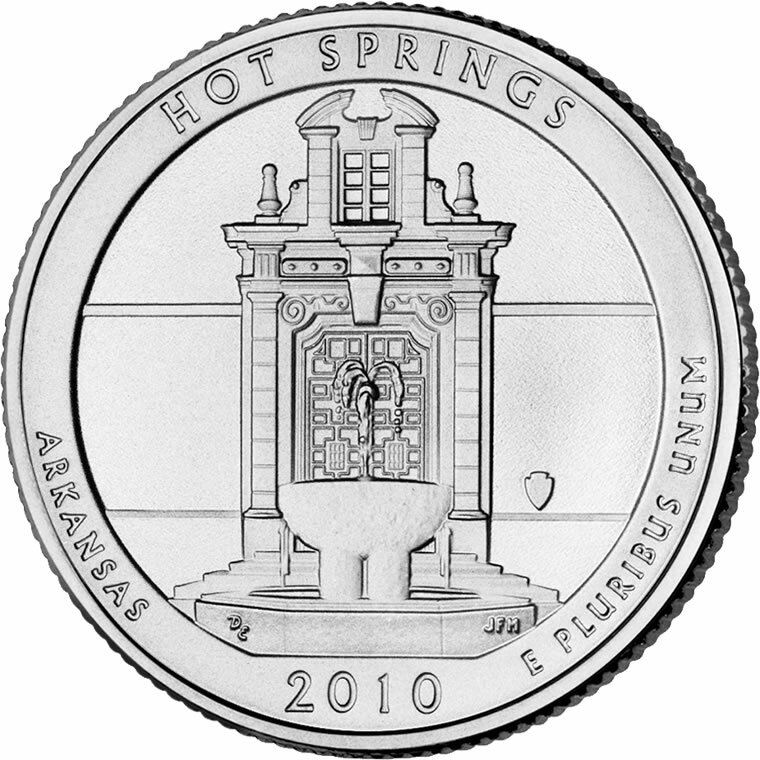 Designed by Don Everhart and sculpted by Joseph Menna, each Hot Springs coins showcases an image of the facade of the Hot Springs National Park Headquarters Building with a thermal fountain shown in front of it. 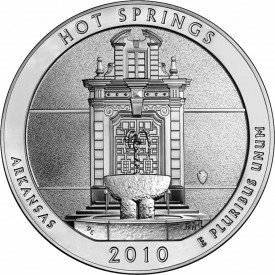 Also shown are the inscriptions HOT SPRINGS, ARKANSAS, 2010 and E PLURIBUS UNUM. 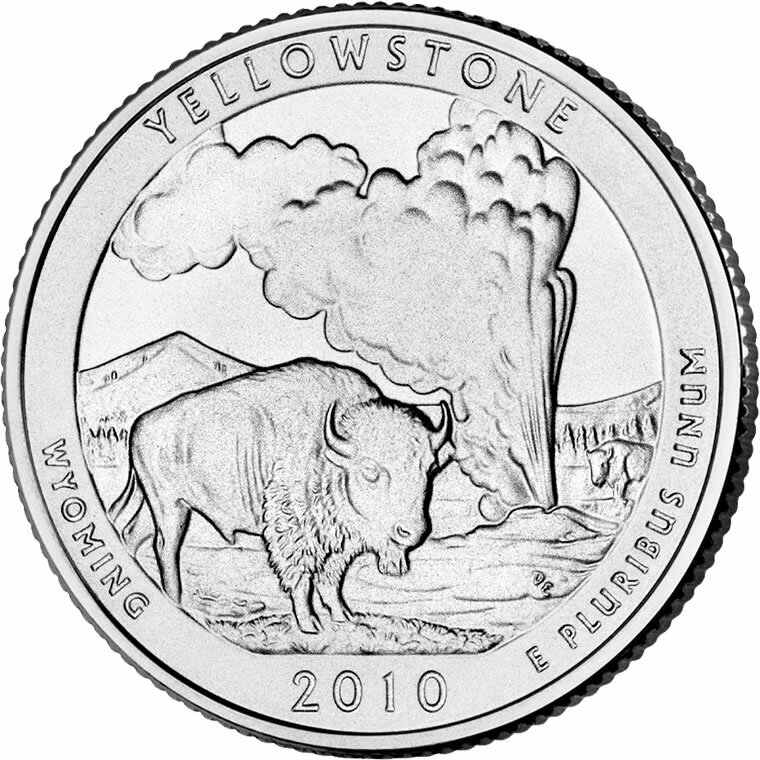 Showcasing both the wildlife and thermal features of Yellowstone, the reverse of this coin contains an image of bison around the Old Faithful geyser. 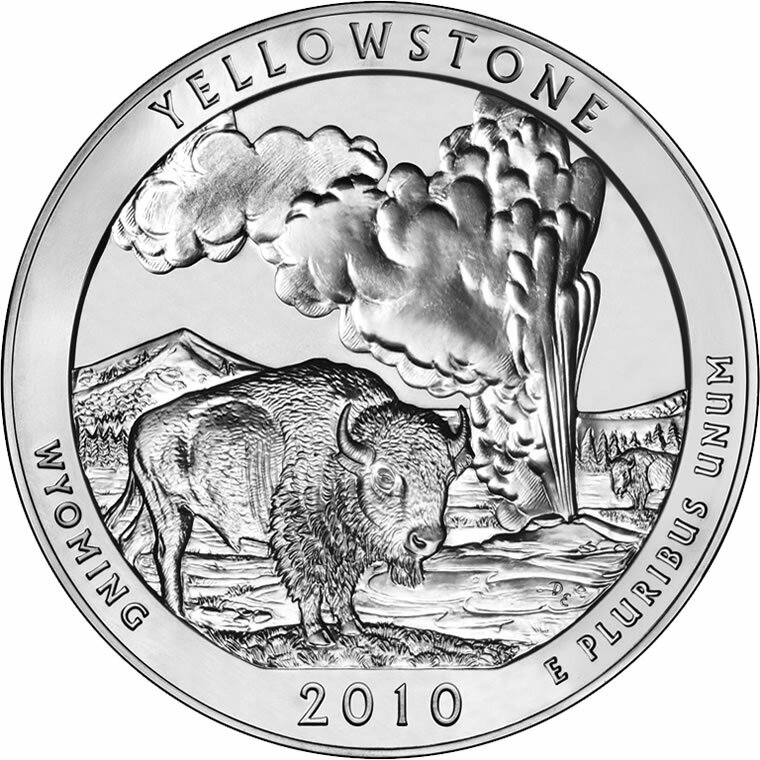 The inscriptions of YELLOWSTONE, WYOMING, 2010 and E PLURIBUS UNUM are also included. It was designed and sculpted by Don Everhart. 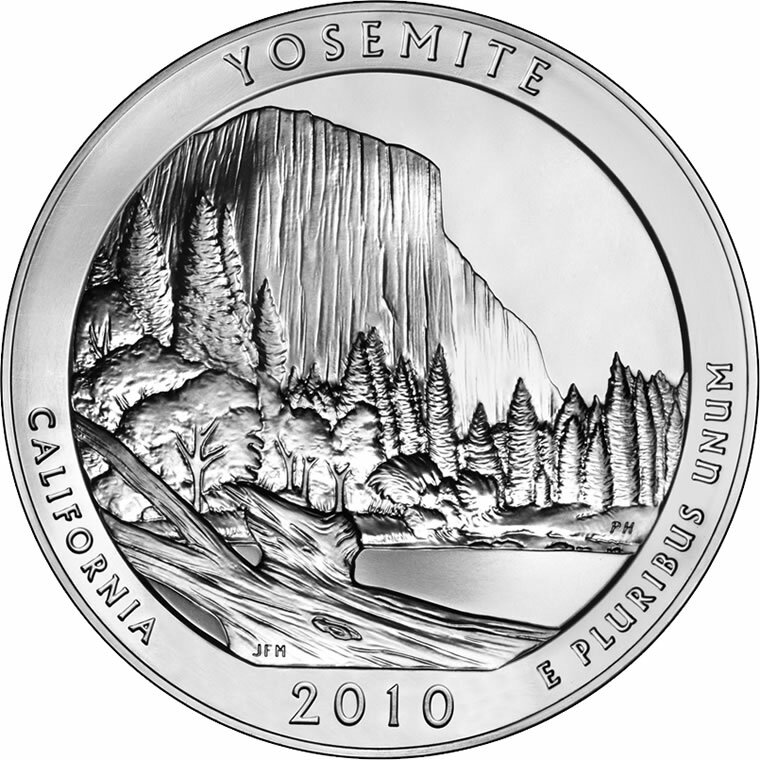 Iconic El Capitan, a massive granite monolith found within Yosemite is shown on the reverse of this coin along with the inscriptions YOSEMITE, CALIFORNIA, 2010 and E PLURIBUS UNUM. It was designed by Joseph Menna and sculpted by Phebe Hemphill. 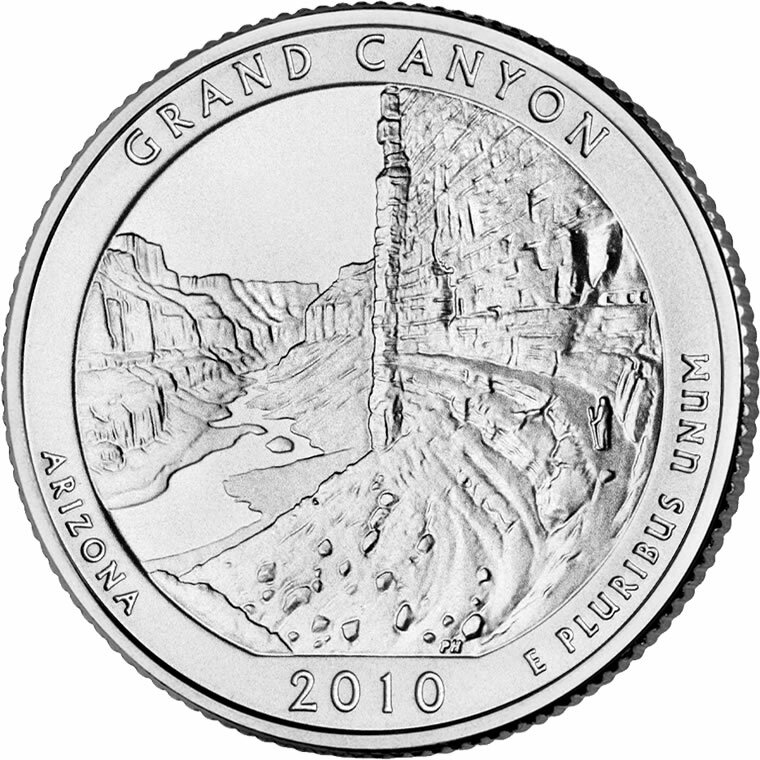 Designed and sculpted by Phebe Hemphill, the reverse of the Grand Canyon Quarter features a view of the granaries above the Nankoweap Delta in Marble Canyon near the Colorado River, The inscriptions GRAND CANYON, ARIZONA, 2010 and E PLURIBUS UNUM are shown surrounding the design. 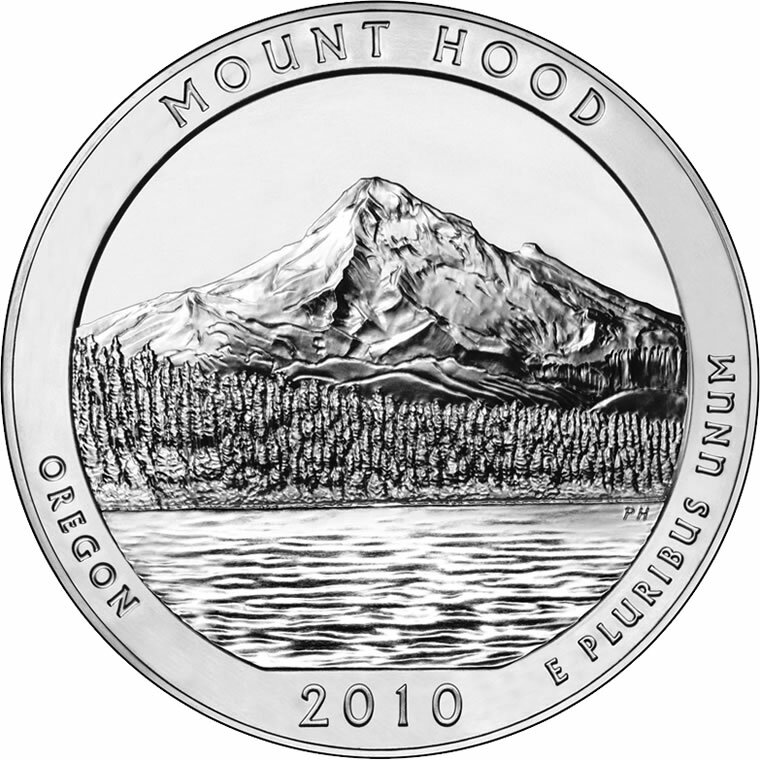 Also designed and sculpted by Phebe Hemphill, the Mount Hood Quarter shows an image of Mount Hood with Lost Lake in the foreground. 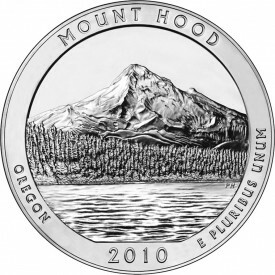 Inscriptions included are MOUNT HOOD, OREGON, 2010 and E PLURIBUS UNUM. 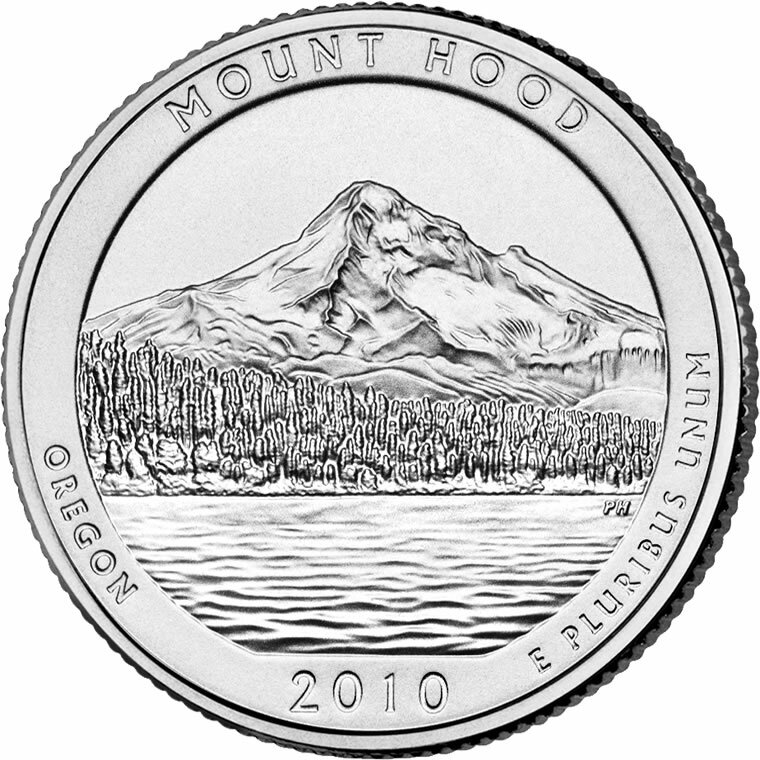 The obverse of the 5-ounce silver coins feature the restored 1932 portrait of George Washington by John Flanagan, as seen on the America the Beautiful Quarters. 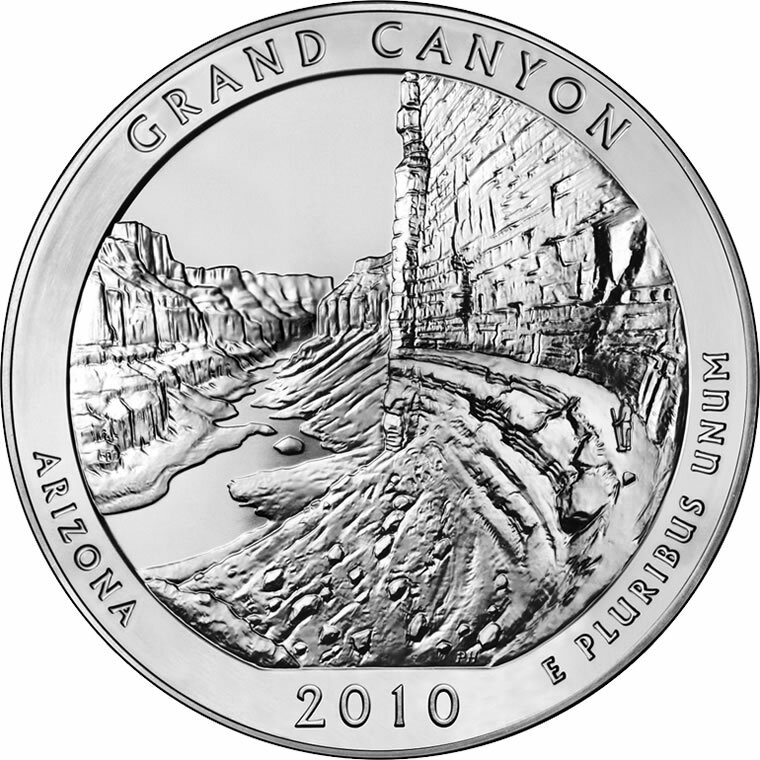 Inscriptions include UNITED STATES OF AMERICA, LIBERTY, IN GOD WE TRUST, and QUARTER DOLLAR. 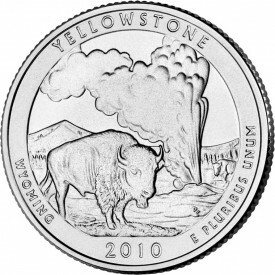 From what I have seen, the authorized distributors are holding onto the coins and not responding to inquiries — waiting on prices to rise or figuring out how to charge the highest price while still remaining in compliance with the new guidelines? I thought distributors were supposed to distribute. As usual with anything related to the Mint, it is the citizens that pay through the nose. I saw the Home Shopping Network offering them for $5,000 a set yesterday evening (January 5th). They said they had 210 sets. This system is working out great for the middle men. I called the Mint and was told to call (202) 354-7500 if I had a complaint. I was told this was the office in charge of bullion coins. There was a recording, but you can leave a message.